The family tree never looked so good. My husband’s aunty has been busy tracing the family tree over the past year and her discoveries have been both exciting and surprising. Thanks to the wonders of the internet and the ability to access records previously housed on shelves somewhere, tracing your ancestors has never been easier. However once you have sorted out who belongs with who you need a way to display the information. 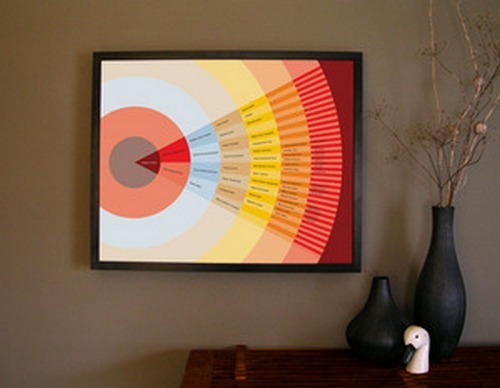 Turn your family tree into a piece of modern art with a superb customised chart from My Tree and Me. Describing their business as ‘modern genealogy’, My Tree and Me has created a number of non-traditional family trees to illustrate family connections. The bold ‘Slice of Life’ chart shows seven generations in a way that truly is modern art. On a smaller scale, but equally eye-catching is the ‘Ripples in a Pond’ chart. Both are available in bright or neutral tones. The ‘Minimalist Octopus’ and ‘Proud as a Peacock’ charts are visually more intricate but nonetheless striking. The My Tree and Me website also lists some helpful links for researching your family history. I think a family tree presented in this way would make a fantastic gift for grandparents. Prices range from US$55-95 for customised charts and between US$48-70 for DIY charts. My Tree and Me ships to Australia.